Why is that we tend to be more successful at pursuits we are genuinely passionate about? Why does time seem to drag when you are completely bored and uninterested in a task? How come you can easily lose yourself in a task that really piques your interest? According to positive psychology, doing things that you find genuinely interesting and stimulating can put you into a state Flow, which is defined as an ‘optimal state of consciousness where we feel our best and perform our best.’ During flow, self-awareness and the ego can dissolve, meaning you become completely focused and immersed in the activity for its own sake. Flow has been linked to enhanced performance and creativity across a wide range of activities, such as sports, artistic pursuits, and even in the workplace. Perhaps you can visualize a time when you became so focused and passionate about something that time just dissipated? What Does Flow Feel Like? Psychologically, riding a state of flow can feel incredibly pleasing and liberating. As we immerse ourselves in an activity that stimulates our passions, curiosity and interests, we lose track of the world around us and can enter unusual states of creativity and productivity. According to psychologist Mikhal Csíkszentmihályi’s landmark book Finding Flow: The Psychology of Engagement with Everyday Life, the feeling of flow is associated with these ten factors, although not all of them need to be present to experience it. Have you ever experienced some or all of these? You know that the task is doable, and you can strike a balance between skill level and the challenge presented. You lose track of your physical needs. What Does Flow Look Like in the Brain? A variety of processes occur simultaneously in the brain when we enter a state of flow. Essentially, these processes are threefold and together they help explain why during flow, the brain is capable of enhanced creativity and productivity: Transitions in brainwaves, deactivation of the prefrontal cortex, and changes in neuro-chemistry. While in a state of flow, our brainwaves transition from the more rapid beta waves of waking consciousness to slower alpha waves, and even to the border of much slower theta waves. Alpha waves are associated with relaxed and effortless alertness, peak performance and creativity, while theta waves are associated with the deeper dream-state consciousness and experienced predominately during REM sleep. During flow states, the Pre-Frontal Cortex (PFC) becomes deactivated in a process called “transient hypo-frontality.” The PFC is the area of the brain that houses higher-level cognitions, including those that help us to cultivate our ego and sense of self. During a flow state this area becomes deactivated, helping us lose ourselves in the task at hand and silence our criticisms, fears and self-doubts. Flow states also trigger a release of many of the pleasurable and performance- inducing chemicals in the brain, including dopamine, serotonin, norepinephrine and endorphins. A 2014 study shows that when are intrinsically curious about an outcome and driven for answers, dopamine is released in the brain, helping to solidify our memories. These findings suggest why flow states are good for promoting learning and memory in addition to creativity. Do Something that Interests You. Flow comes most naturally when we are intrinsically motivated, excited and curios about the task. So if you are looking to get creative and productive, choose to focus on a task that you enjoy and already feel passionate about. If this is for work, or you don’t have a choice of the task, try to identify elements of the tasks that excite you. Maybe there are certain parts of project or elements of an assignment that interest you? Pay special attention to those. Be specific when you are getting started on a task. What is the goal you are aiming for? Are you trying to finish a painting? Write a new song? Complete a presentation? Or perfect a new yoga pose? This will help to hone your focus and keep you on task. If you try to do too much it could overwhelm you, and if you do too little you might not spend enough time in deep concentration to reach a flow state. Find A Quiet and Productive Time. Most people find that an environment of peace and quiet works best for inducing a state of flow, possibly because of how brainwave patterns shift into slower frequencies during flow. When you begin your work, try to cultivate a calm, quiet environment. Also, make sure to identify when you are most productive: For some, this is first thing in the morning, and for others it is afternoon. For me, it is late at night. Identify the right time for you to be creative and block it off to engage in your flow time. Interruptions are the nemesis of flow. Every time get distracted, whether it is a roommate speaking to us, our phone beeping, emails coming in, a distracting song, or a messy desk, it can pull us out of flow and quicken our brainwaves to beta state. When you decide it is time to get into flow, turn off the phone, ask your friends, family or roommates not to disturb you, and tidy up your work space before you get started. Focus as Long as You Can. Once you are able to sit down during a quiet productive time without distractions, try to stay focused for as long as you can. At first, especially if you are new to the task, you may only be able to focus for five or ten minutes. This is OK: Just keep practicing! As you continue to direct your energies to focusing, you will train your brain to more easily and fluidly drop into the flow state and before long, hours will be passing by like minutes. Match Your Skills to the Task. We can best enter flow when we are working on a task that is suited to our skill level. In other words, when we are well prepared for the task at hand, we are more likely to experience flow. Csíkszentmihályi gives the example of a runner experiencing flow during a marathon for which she has trained for several months. But There is No Harm in Stretching Your Skills Slightly. Your skills should match the task at hand, but it is also possible to stretch your skills slightly past your comfort zone to maximize flow. A little bit of a challenge can be a great thing. So perhaps you are trying a new yoga move that is extra difficult. Or you are recording a song using new software. As long as the background skills are there, pushing yourself a little bit can be excellent for bringing you into a concentrated, productive state. Finally, please remember that the experience of flow is a PROCESS, not an outcome. In other words, working and creating from a place of flow is a life skill that you can strive to master with practice, and this usually does not happen overnight. Just keep trying and do not give up even if you don’t nail it right away. Remember, flow is all abut enjoyment and living in the present moment. If you become to wrapped up in the outcome, then it can take your enjoyment away. Who really cares what the painting looks like, so long as you enjoyed painting it right!? Just keep trying and continue to be open to the creativity flowing through your space. Mr. Robinson spoke these words in his popular 20-minute TedTalk entitled, “Bring On The Learning Revolution”, which is embedded below. This is one of the best lectures on a topic that so desperately needs addressed in our world and I recommend it to anyone. The current educational system, which stresses compartmentalization and standardized testing, is limiting the inherent abilities we all possess. It’s as if the educational system is simply set up in a way that directs us only to memorize and regurgitate rather than question, express, connect, and create. We are taught to fall in line and adhere to “The Matrix” rather than being our unique, authentic selves. Though we could go deep down the rabbit hole showing the financial corruption involved at all levels of the world’s educational system, we’ll instead focus on solutions. The learner-centered education, or mastery model, which is the way Maria Montessori’s schools have been designed, has been at the center of this revolution in education for quite some time. The base of this model is the belief that the children must be in control of their own learning and that the happiness level of the student is reflective on how effective the education is for him or her. The adult teacher shapes the environment in a way that encourages questioning, curiosity, mastery of skills, expression and creativity. Sounds about the opposite of what most traditional schooling systems create, doesn’t it? In fact, looking back across hundreds and probably thousands of years, we see that the way we are hard-wired to learn is very different from a traditional school setting. Think about it. Prior to these systems of today, we learned through observation, hands on application, apprenticing, cooperative learning based in groups and pairs. The atmosphere of the learning environment was also completely different. In today’s model, fear is often at the base of learning. The fear of failing on a standardized test so one can receive a “good grade” is prevalent everywhere. One doesn’t have to be a social psychologist to understand that true learning and mastery is very difficult when a person is in a state of fear and stress. However, when the environment is not competitive but rather cooperative, an environment where there isn’t the fear of failure, the person can thrive and gain the mastery of multiple skills. 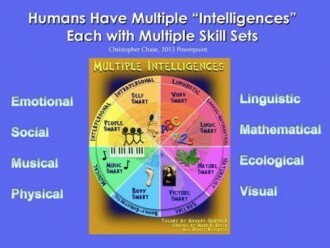 In fact, Howard Gardner’s Theory of Multiple Intelligences , which is based on solid and unbiased psychological research, says that each person has at least eight different domains of potential intelligences, each of which can be mastered over time using multiple skill sets. The Creative Grassroots Revolution, which like all truth-based revolutions, cannot be stopped. Keep questioning, keep proposing holistic solutions, keep in the state of curiosity and wonder.